After receiving some extra peanut butter from a relative, I decided the obvious thing to do was find a new recipe to use it! In a First United Methodist of Stanley (N.C.) cookbook, I found the perfect one: Peanut Butter Custard. Even better, the recipe had been submitted by Matthew’s mom, Chris Tessnear! It is by far one of the easiest pies I’ve ever had the pleasure of baking, and it is unique and delicious in taste. 1. 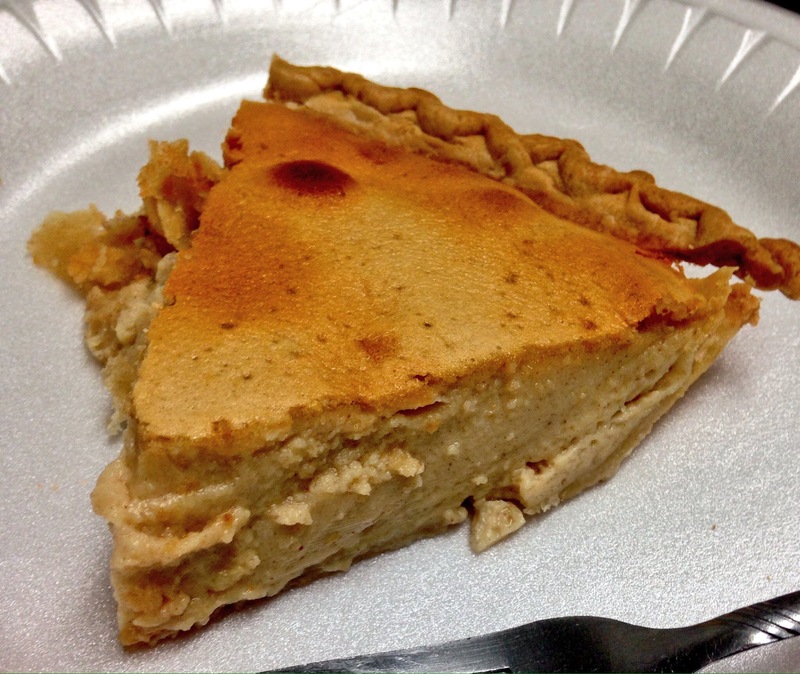 Mix all ingredients in a blender (or use a hand mixer) and pour into the pie shell. Be careful to mix thoroughly, because the peanut butter will try to stick to the bottom of the bowl. Matthew’s take: Perhaps the most unique and pleasing part of this pie for me was its level of sweetness. It wasn’t rich like the chocolatey pies of the world, but it also wasn’t a sweetless, savory pie option. No, it baked perfectly right in between. The mixture of ingredients combine to keep you from being too heavy on the peanut butter taste, too. With this pie, you get less of the inside of a Reece’s Peanut Butter Cup and more of a smooth, slightly nutty custard. This is definitely one I would recommend to someone who likes desserts but isn’t a big fan of chocolate or heavy sweet treats. Previous Foodie Travels: Hyman’s Seafood, Charleston, S.C.
Next Foodie Travels: Copper Penny Grill, Forest City, N.C.